Fleet 345 secret? Easy one: the Criterium! Where can you find a place where you can race every Saturday, all year long, and never having to skip a race day? 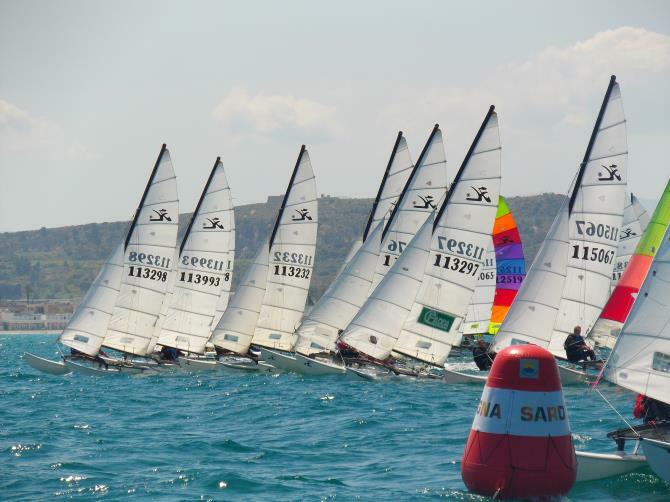 If you own a Hobie Cat and come to Cagliari you can be sure that every Saturday you will find at least fifteen boats lining up on the starting line, eager to compete in a four week regatta format. Long life to the Criterium ! Poetto beach. Saturday afternoon, 2 p.m. January to December. 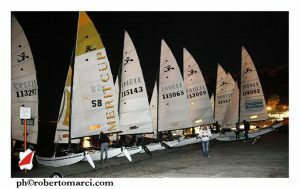 Windsurfing Club Cagliari fleet 345, which numbers more than 30 boats, gets ready to sail for the usual training session, referred to as the “Criterium”, with the help of a very professional race committee. The fierce competitors can race all year long thanks to the usually mild weather, even in January, and there is battle for everyone, for those who fight to win the race and for those who fight even harder in rear of the pack. 20 to 30 boats at the start, and you do not see such numbers in some national regattas in mainland Italy. 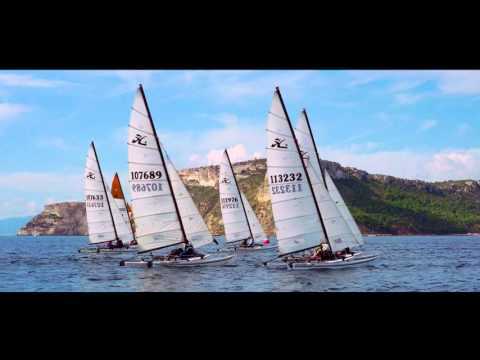 Our Italian friends and catters take no offense but numbers do not lie: the biggest fleet is Cagliari’s 345 and unfortunately travels from Sardinia can be very expensive and therefore not for every pocket. Truth is that in Cagliari, young and not so young people – from sixty plus year olds who jump around on their cats to high school kids – forget about age and just enjoy this beautiful game… Former windsurf champion Antonello Ciabatti and his ex coach Alberto Diaz now race against each other. Young school kids every Saturday afternoon forget their books and sail out on their cats. 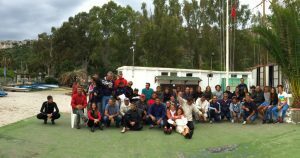 Thanks to the sailing school they train during the week as well, and their grades are not affected at all by their sailing passion. Federico Budroni, who with his crew Chiara Beghetti finished third at the European Championship, is a top student. As always happens when passion is the common denominator, racing a Hobie cat in Cagliari is pure fun not only for the actual race but for everything that surrounds the event, people and episodes which could make the fortune of a television fiction: a stunning venue with wonderful weather, the Hobie Cats spectacularly sailing in strong breeze and the sailors’ stories, fights and loves on the side! 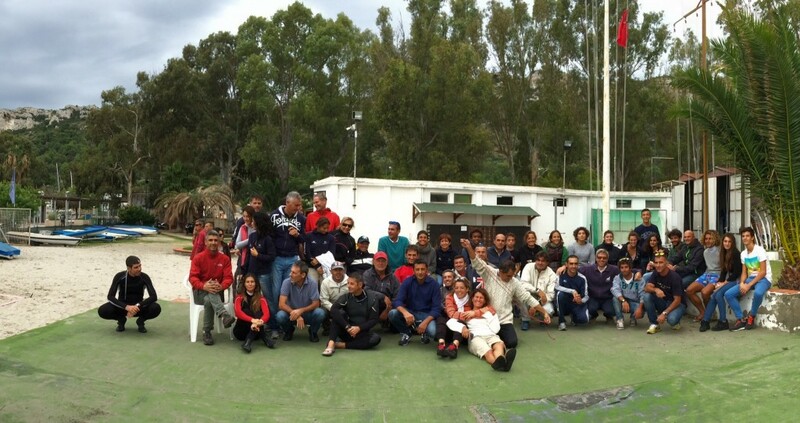 Before and after the race quarrels, jokes and pranks never lack in this fleet that really feels like family! 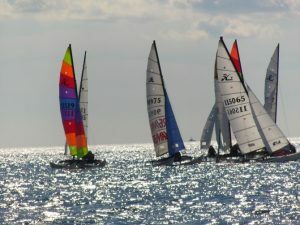 In Cagliari the Hobie Cat mania is rampant and even off-shore sailors are being tempted by the allure of the “Hobie way of life”. The Hobie Cat Italian Association and the Fleet 345 invite the catters community to come and enjoy with us some great sailing and much more. We are much better in hospitality than speaking English! 70 % of girl’s population in Cagliari is…so beautiful!